Phil Mayall, development director at English Cities Fund (ECf) and Muse Developments discusses how transport hubs and investment in rail infrastructure are helping to reshape the way we do business. The railway line once divided Salford and Manchester but with a flurry of new residential and commercial developments, as well as vastly improved connectivity, the two cities are now merging ever closer together. And the Ordsall Chord is at the centre of all of this. Not just literally at the centre, but also in the sense that it has provided property developers like us with the confidence to invest in schemes like New Bailey. As the list of office occupier requirements grows, public transport remains firmly in the top three – and rightly so. Development is about people. Our investment is driven around people. Proven by the fact that when we have a first viewing with a potential occupier, more often than not, it is with the HR director. 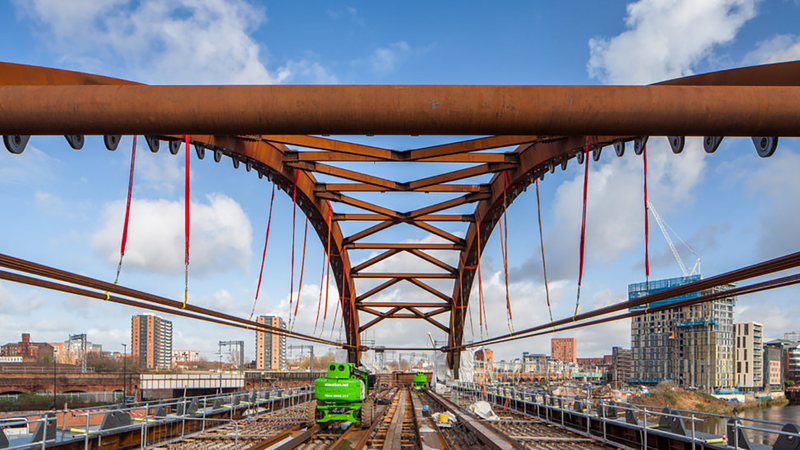 As the Ordsall Chord draws ever nearer to completion, Salford Central Station has the potential to become a significant transport hub, linking major stations in Manchester and Salford and in turn, making it much easier for people to move around the cityscape. We need to grab everything we can from this joined up infrastructure. When people come to the North West from London, they always ask how far New Bailey is from Piccadilly Station but when we travel to London, we understand the infrastructure – we go to Euston then straight on the tube to get us to point B. We need to replicate this here so that people understand where the infrastructure is in Manchester and Salford and how to use it. There’s no doubt that railway stations are fast becoming the beating heart of urban regeneration. Network Rail recently held at event at One New Bailey, the second floor of which proved an excellent platform to view the giant 600 tonne archways being lifted into position on the Ordsall Chord. The facts and figures shared by Network Rail’s chief executive Mark Carne around wider economic development and growth in towns like Crewe, and how Cheshire East Council has used creative funding streams to attract development and help fund future investments in the town, speak for themselves. But it doesn’t stop there. Mr Carne also outlined some less well known regeneration initiatives taking place around railway stations, including the 8,000 businesses that have built into railway archways throughout the UK, making Network Rail a huge landlord. Also, the transformation of what used to be railway car parks into profitable bistros and theatres. The opportunities it seems, are endless. It’s no secret that Muse Developments has seen massive potential and value in building its mixed-use schemes around transport hubs, current cases in point being New Bailey, Stockport Exchange and City Place in Chester, a formula which really works and, judging by the responses that we have had from occupiers to date, continues to make perfect sense.